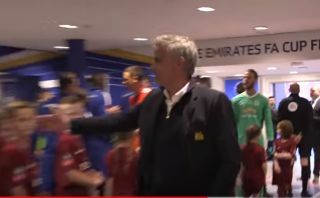 Video footage appears to show Chelsea forward Eden Hazard and Manchester United manager Jose Mourinho blanking each other before the FA Cup final. Hazard ended up scoring the winner for the Blues against the Red Devils in a closely-fought 1-0 win at Wembley yesterday afternoon, but was there a moment of tension between himself and his former manager beforehand? Mourinho did not leave Chelsea in the best circumstances after the team’s form took a real dip in the first half of the 2015/16 season, which ultimately led to the Portuguese being sacked that December. This coincided with one of Hazard’s worst seasons, so it may be that the pair were not getting along at the time. Either way, the video above (6.26) shows Mourinho being friendly with another of his former players, Cesc Fabregas, while he and Hazard seem to pay no attention to each other. It can be hard to draw too many conclusions from a relatively short and isolated piece of footage, but it likely wouldn’t be the first or last time Mourinho rubs a player up the wrong way.